21 Savage and his people believe his arrest by ICE may be motivated by revenge … revenge for his new music that condemned the behavior of immigration officials. The song in question, “A Lot,” has the following lyrics … “Been through some things so I can’t imagine my kids stuck at the border. Flynt still need water. People was innocent, couldn’t get lawyers.” He performed it on ‘The Tonight Show’ with Jimmy Fallon at the end of Jan. 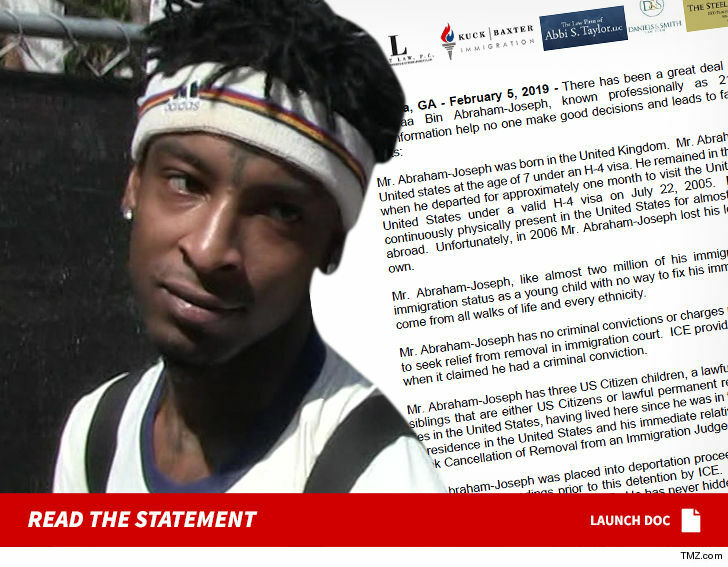 The statement also says ICE knew how to find 21 Savage since 2017, when he applied for a U-Visa and gave his address. So the insinuation … they weren’t going to arrest him until they got pissed off by the new song. As we reported … 21 Savage was picked up by ICE early Sunday morning in Atlanta and taken into custody for possible removal from the U.S. We learned the arrest may have been triggered by the rapper applying for a U-Visa … which led to a background check that discovered he was from the UK. An ICE agent claimed 21 has been living a totally false public persona … and had overstayed his visa. Savage’s manager says since he got busted, he’s been spending 23 hours a day in lockup, with his only communication being 10-minute phone calls.